So I had a hard drive (SSD) failure some time ago (it lasted 5 years of intense use, so I kinda expected that to happen). Luckily I had my Time Capsule running all the time, so it was a no brainer to buy a new SSD for my Macbook Air and restore it. However after restore I found out that my laptop wasn't quite as fast as it used to be, moreover I'd get frequent freezes & beach-balling that would last up to 20 seconds. Needless to say, I was quite concerned - I was running many system diagnostics, tried cleaning it up, did SMC & PRAM reset, but nothing seemed to help much. So in case your restore left you with an older file system, you need to reinstall MacOS from the App Store. 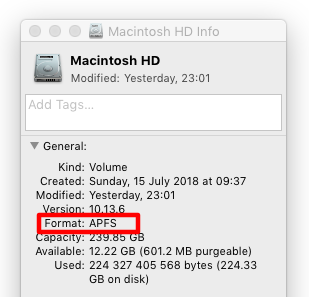 Unluckily I don't remember the exact details how I made the installer go through the installation again, but I managed to do this by finding the installer in Applications folder - without starting from the recovery partition (which would probably try to clean install my OS). I hope that helps someone! Not the answer you're looking for? Browse other questions tagged backup time-machine ssd restore time-capsule .